Many factors contribute to a productive office environment; Among them, a healthy, happy workforce. If you take a look around, the current corporate design trend features open “pits”, glass-enclosed rooms, and wall-less offices to maximize collaboration and creativity. Many employers feel that an open, airy layout instills a sense of equality among workers and can lead to increased motivation and achievement. But there are some downsides to this modern, now ubiquitous office interior. 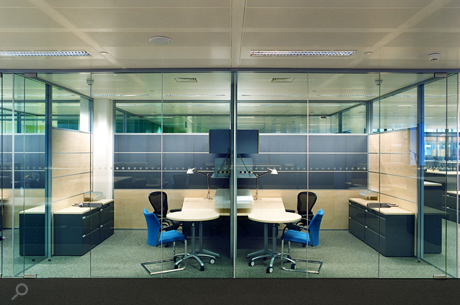 The glass walls meant to encourage brainstorming sessions amongst coworkers also serve as a distraction for many. An "open plan" that eschews private offices might increase work-related communication but it also leads to sensory overload. Studies show that open-plan offices can make workers frustrated and insecure. They’re also more likely to suffer from hypertension, stress, the flu and exhaustion. It’s important to take into account the type of work being done to determine what layout is most conducive to a productive office environment. For creative industries such as advertising or graphic design, open space can greatly increase brainstorming and eventual output by employees. In other fields however, this might not be the ideal set up. Emerging research strongly suggests that people are more focused and constructive when they enjoy privacy and freedom from interruption. Don’t assume that a sleek, modern design is what’s best for your company just because it’s in vogue. Environmental satisfaction contributes greatly to overall job satisfaction for the majority of employees. Wellness comes in all different forms and an appropriate office set-up goes a long way towards keeping workers satisfied, healthy, and productive. Hi this is my first visit to this blog and i leave my first comment also nothing to say i enjoy reading your post.